In July 1931, Prohibition Agents Curtis Burks, George Small, Glen Palmer, Mark Weiser, Kenneth Thompson, George Craig, Clifford McMaster, Allen Aldridge, Ray Gaston, and A. C. Anderson, along with six local officers, were conducting liquor investigations along the north side of Kansas City, MO. While executing a search warrant at the Lusco-Note Flower Shop, the agents discovered a well dressed young man, later identified by the agents as Charles Arthur "Pretty Boy" Floyd, in a back bedroom. Observed on the bed were a number of .45 caliber bullets. Agent Burks searched the man and removed a .45 caliber pistol from his waistband. However, before he could continue the search, the suspect drew another .45 caliber pistol from the opposite side of his body and shot Agent Burks twice. Agent Burks died two days later. "Pretty Boy" Floyd then ran into a hallway where he encountered Agent Anderson, who he also shot. As Floyd ran from the building, he shot and wounded Kansas City Police Officer Clarence Reedy and a civilian, M. Wilson, all while making a clean escape. At about the same time, a search of the entire building was underway and another suspect, John Calio, was found hiding inside a box. He was shot and killed by Detective-Lieutenant E. C. Nelson when Calio assaulted him and attempted to take away his shotgun while resisting arrest. Agents later searched the room where Floyd was first encountered and uncovered laundry bills and a man's suit bearing cleaner's marks and a label from a Chicago tailor. A trace of the suit revealed that it had been handmade for Charles Arthur Floyd. Prohibition Agents at the scene later positively identified Floyd's picture as being the same person that had killed Agent Burks. 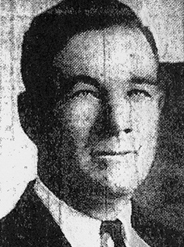 Floyd was later killed during a shootout with local officers and FBI agents in East Liverpool, OH, in October 1934. There is some controversy about Floyd, since the local newspapers and police reports show that Calio was responsible for the killing. However, official records at ATF show that agents clearly identified Floyd as the shooter of Agent Burks and wounding of Agent Anderson. 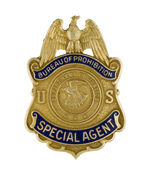 Agent Burks joined the Bureau of Prohibition on February 3, 1930, with an annual salary of $2,300. Agent Burks was born in Bedford, IA. He was survived by his wife, Gladys and son, Curtis, Jr.